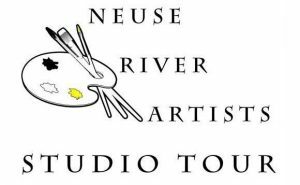 The 2019 Neuse River Artists Studio Tour is the second annual tour of several local artist studios and hub centers, featuring over 50 artists. A non-profit project of Community Artists Gallery & Studios, in coordination with the Craven Arts Council, Twin Rivers Artist Association, Shop Class, New Bern Arts & Wellness Center, The Sanctuary Gallery, and other sponsors, each location will feature one or more artist, demonstrating their talents and selling their work outside of a gallery setting, enabling tour goers to meet the artists in person, see how they create, and learn what inspires them. The tour will take place with an opening during Art Walk at the Harrison Center on Middle Street in downtown New Bern, and continue on Saturday, May 11th from 10-5 and Sunday, May 12th from 12-4. Each site will be displayed on a map, with information about every artist on the tour. Maps for this free, self-guided event will be available at several locations in New Bern, including at Community Artists Gallery & Studios, The Bank of the Arts, The Sanctuary Gallery, The Uptown Gallery, Greater Good Gallery, The Red Shoe Gallery, Mitchell Hardware, and The Accidental Artist. For details and questions, please email chris@thesanctuarygallery.com or call 252-571-8562.